We offer superior quality, disposable and food grade plastic boxes/plastic packaging boxes that are used for a host of packaging purposes. Considering diverse factors such as defect free and hygiene of the raw material, we offer a range of multicoloured packaging boxes. 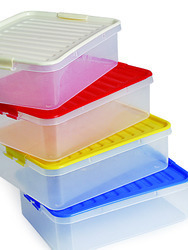 These are available with lids that keep the food air-tight in the box. Our product is available in various shapes and sizes with attractive look and finish.